A144 Industrial V-Belt. 1/2" Wide, 146" Outside Length. A-144 Industrial V-Belt. A144 Industrial V-Belt. 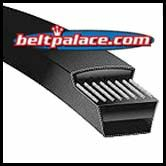 1/2" Wide, 146" Outside Length (145.3" Datum length) Industrial V-Belt. Suitable for all industrial applications, including v-flat drives. Composite, multi-purpose construction, these belts resist oil and heat, ozone, sunlight, weather, and aging. 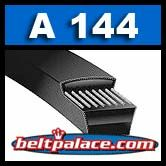 A144 Classic V-Belt Replaces: Gates, Bando, Goodyear, Masterdrive, Dayton, Dayco, and more.